Meet the good guys: Slender and Roundhead Lespedeza (also called Bush Clover), Lespedeza virginica and Lespedeza capitata, are both native lespedezas. Both are great for wildlife. The seeds are consumed by various birds including Mourning Dove, Bobwhite Quail, Wild Turkey, and Slate-Colored Juncos. The flowers are visited by a variety of native bee species as well as some butterflies. The plants are high in protein and eaten by many herbivores both wild (e.g. deer, rabbits, groundhogs) and domestic (e.g. cattle, goats). 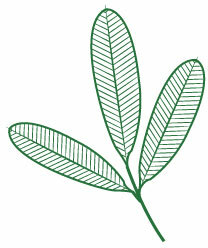 Lespedezas are also legumes; legumes have a unique involvement with certain bacteria in the soil. The plant feeds the bacteria and in turn the bacteria take nitrogen from the air that is inaccessible to plants and give it to the plant. In the long-run, this adds nitrogen to the soil and acts as fertilizer to other plants. Interestingly, Slender Lespedeza is also being used in cancer-treatment research. Other good guy lespedezas can also be found in native grasslands including Trailing Lespedeza (Lespedeza procumbens), Hairy Lespedeza (Lespedeza hirta), and Violet Lespedeza (Lespedeza violacea). Meet the bad guy: Sericea Lespedeza, which goes by aliases of Chinese Bush Clover, Silky Bush Clover, and Lespedeza cuneata was introduced into the United States from east Asia. It has been planted for erosion control, livestock forage, and wildlife cover. When the plant was introduced, the diseases and insects that once kept it in check were left in Asia. As a result, it has become very competitive in grasslands and even been declared a noxious weed in Kansas. The ugly: The ugly part of this story is that the bad guy, Sericea, tries to pass itself off as one of the native lespedezas, Slender. 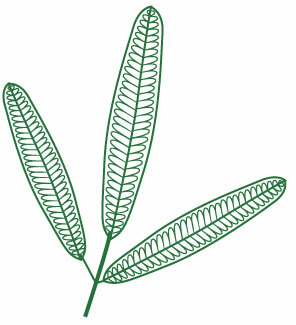 To the untrained eye, the form of the two plants is often very similar being tall and skinny with small leaves. Sometimes late in the season the form of the two plants will vary with Sericea being bushier, but there are two other characteristics that are very helpful in distinguishing the good from the bad. One is bloom color, which is obviously only useful for a small portion of the summer while the plants bloom. The other is the appearance of the veins in the leaf which is best seen on the back of the leaf or when held up to the sky.